But the strong dollar finally caught up with the U.S. economy, which has been slowing down precipitously. After the “weak yen” of 2013 and the “weak euro” of 2015, it looks like it’s time for a weak dollar again. The currency wars have returned to U.S. shores with the Fed’s dovish posture in its statements on March 16. Janet Yellen reinforced that dovish posture this Tuesday in her speech to the Economic Club of New York. 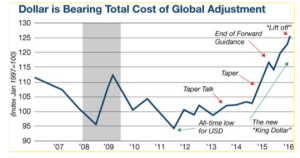 There are critical turning points where a long-term directional trend is set to reverse. Today’s “winners” (the strong currencies) suddenly become “losers” (the weak currencies), contrary to most expectations and Wall Street forecasts. These trend reversals are not unusual in currency markets; they are to be expected. Major currencies exhibit equilibrating characteristics not seen in securities markets. Stocks and bonds can go to zero (in the event of default or bankruptcy) and seemingly go to infinity (when a tech startup becomes the next Facebook or Uber). But such extremes are highly unusual in currencies, the exceptions being hyperinflationary episodes such as Zimbabwe or Venezuela. Major currency cross-rates will exhibit strong trends (up or down), but eventually, the trend reverses. In the past five years, the euro has traded as high as $1.48 (April 29, 2011) and as low as $1.05 (March 15, 2015). That’s a wide range, but it’s still a range. Lately, the euro has trended up toward $1.13. But no analyst seriously expects the euro to hit $2.00 or $0.50 in the foreseeable future. The point is currencies trade in a range, which means they exhibit critical turning points at the range-bound highs and lows. In a world without a currency anchor, whether gold, dollars or Special Drawing Rights (SDRs), currency cross-rates are highly volatile. 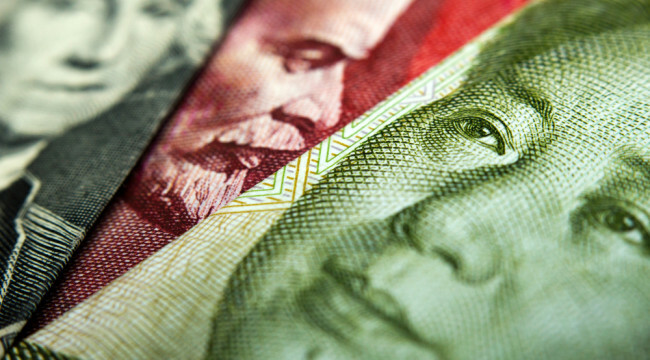 On a day-to-day basis, currencies are notoriously difficult to forecast or trade. Still, there are longer-term dynamics at play that are useful for making directional forecasts. You can make large profits by getting the direction right and giving a trade enough time to work in your favor. We are getting close to one of those turning points for the U.S. dollar now. In order to forecast such turning points, I use my proprietary IMPACT method. This method involves the use of complexity theory to spot “emergent properties.” An emergent property is a systemic occurrence that seems to come out of nowhere and cannot be inferred from complete knowledge of the system elements. Others refer to emergent properties as “black swans.” We prefer the term “emergent property” because it fits within an established body of physics and applied mathematics, while black swan is more of a pop concept with no rigorous science behind it. Right now, the most powerful indication and warning is coming from what I call “Yellen’s Conundrum.” Simply stated, the conundrum is this: Janet Yellen and the Federal Reserve want higher inflation; they have said so many times. Their inflation target is 2% using the core personal consumption expenditure (PCE) price deflator on a year-over-year basis. Janet Yellen and the Federal Reserve also want higher interest rates. Last December, the Fed laid out a course of interest rate increases of 300 basis points over three years, which averages out to a 25 basis point increase every other FOMC meeting. They of course allow for some deviations based on “data dependence” and actual economic performance. But the conundrum is that raising interest rates makes the dollar stronger, which is deflationary. When your stated policy is inflationary, how can you pursue a path that is deflationary?You can’t. The Fed’s contradictory policies make no sense. Something has to give. Understanding the Fed’s path and how that path must reverse course is your key to making outsized profits. This is a chart of a leading dollar index for the past 10 years. 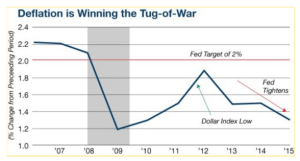 The dollar rallied in 2008–09 (on a fear trade during the panic) and then collapsed from 2009–2011 (on easing under QE1, QE2 and “Operation Twist”). In August 2011, the dollar hit an all-time low and, not coincidentally, the dollar price of gold hit an all-time high. The dollar rallied in late-2011 after the end of QE2 and Twist but then dropped again and leveled off with the advent of QE3 in September 2012. The turning point was the Fed tightening that began in May 2013 with Ben Bernanke’s “taper talk.” The Fed did not actually begin the taper of QE3 at that time, but the mere mention was enough to send the dollar soaring. It also started an emerging markets (EMs) meltdown as hot money capital flows unwound carry trades and fled the EMs for U.S. Treasuries. This massive dollar rally from the Fed tightening continued through the start of the actual taper (December 2013), the removal of forward guidance (March 2015) and the Fed’s “liftoff” of interest rate hikes (December 2015). The entire cycle from low to high represents a 33% increase in the index value of the dollar in 52 months. Gains of 33% are not unusual in stocks, but they are highly unusual in currencies.Even in a world of floating exchange rates, major trading partners are supposed to maintain some stability in their cross-rates. Terms of trade, based on factor inputs, natural resources, demographics, technology, etc., do change over time. But they do not change that quickly. This dollar gain is better understood as a dollar shock based on the Fed’s desire to “normalize” interest rates and end its zero interest rate policy (ZIRP). But interest rate normalization comes at a high cost. The cost is measured in disinflation bordering on deflation. The strong dollar hurts U.S. corporate earnings and stock prices two ways: by crimping exports and hurting U.S. overseas earnings that are translated back into dollars. The red horizontal line shows the Fed’s inflation target. The blue line is a measure of core PCE, the Fed’s preferred inflation gauge. The Fed has not hit their inflation target in eight years. For the past four years, since just after the dollar low of 2011, the inflation index has been moving away from the Fed’s goal. The Fed does not understand this conundrum of higher rates, stronger dollar and more deflation because they are using obsolete models. In the Fed’s view, continued job growth creates labor shortages that allow workers to demand higher real wages. Those wages then exert inflationary pressures on the economy, albeit with a lag. In this view, the Fed’s easy money ZIRP from 2008–2015 will produce inflation any minute now. But there is no robust consistent evidence to support the Fed’s models (called “NAIRU,” the “Phillips Curve” and “FRB/US”). Jobs are, in fact, being created, but the wage pressures and inflation are nowhere in sight. What is visible are higher rates, a stronger dollar and continued deflationary pressure. The dollar declined in value slightly in late February and early March as it became clear that the Fed would not raise interest rates in March, which was originally expected based on the December 2015 FOMC statement. But the decline turned on a dime in late March as the Fed began to signal that it would get back on the rate hike warpath by June or perhaps as early as April. Now Janet Yellen herself seems to have backed off an April rate hike, and the dollar has softened for the time being. But at what point will the Fed lose faith in its models entirely and try to get inflation the old-fashioned way with more ease and a cheaper dollar? What does my IMPACT system tell us about the next turning point in this never-ending currency war? The short answer is the turning point is growing near but is not quite here yet. We look for the Fed to raise rates in June (possibly, but unlikely in April) and continue to make hawkish statements about future rate hikes, despite Tuesday’s speech. This will put upward pressure on the dollar, partially offsetting recent developments. But sooner than later, the weakness in the U.S. economy and stock markets will become obvious even to the Fed. At that point, probably late in 2016, a major turning point in the currency wars will be upon us. Look for the Fed to reverse course, take easing steps (forward guidance, rate cuts, “helicopter money,” QE4 or even negative interest rates) and trash the dollar. When the dollar goes down, the Fed will finally get the inflation it wants. But it may be too little, too late. These turning points and Fed flip-flopping require investors to be nimble to reap huge profits. The ideal trade in this environment would be a short-dated put option on a U.S.-based global company with leveraged exposure to FX translation losses and a cyclical slowdown.